A group of local horticultural volunteers at Syon Lane Community Allotment are celebrating winning a presitigious Green Flag Community award for their efforts. 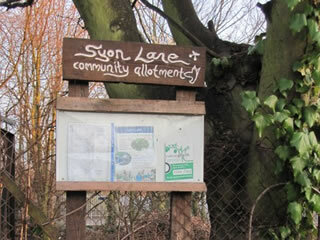 Syon Lane Community Allotment is a strip of land next to Syon Lane train station, which had been unused for 20 years until a group of sustainable agriculture enthusiasts were offered it on loan for 3 years. They have re-opened it as a forest garden and permaculture demonstration centre, a growing space for local schools and also an outdoor area for arts and crafts. Open days are every Sunday from 12pm, and admission is free. The Green Flag Award is a national award that recognises high quality green spaces in the UK that are managed by voluntary and community groups. The Award is part of the Green Flag Award scheme, the national standard for quality parks and green spaces.